A while ago I ordered a copy of Left Coast Libations, a cocktail tome I had seen mentioned once or twice in the Blogosphere and had paged through while sitting at the bar at Merchant. While I still recommend it to anyone interested in craft cocktails (you gotta love Ted Munat’s devil-may-care sense of humor, the meticulously researched recipes, and the gorgeous photography), the many cocktails found between its covers can be, well…tedious. Homemade ingredients abound, and brand recommendations are the norm. Dried chili-infused orange bitters. Kumquat marmalade. Basil foam. Buckwheat honey syrup. Angostura-Rum fig brûlée. Smoked cider air (air, for Heaven’s sake!). Oh, and remember, Maraska maraschino liqueur is infinitely drier than Luxardo, rendering this ubiqiutous maraschino brand unusable in a large number of the drinks presented. Stir all ingredients with ice and strain into a chilled cocktail glass. Garnish with a lemon peel. Coltharp recommends cask-strength Thomas H. Handy Sazerac Rye as a replacement for the Rittenhouse. Admittedly, I chose this drink because I had all the ingredients on hand, one of ten or so in the book that I can make exactly as listed. The Historic Core is exquisitely balanced — more so than any other drink I’ve had in a long time. Most come out as, “Oh, this is rye with a bit of this and a bit of that, but mostly rye, and they play well together.” Not this guy; it’s way better. You can’t tell where one ingredient ends and the other begins. Spicy, herbal, fruity, bitter, sweet, it’s all there. 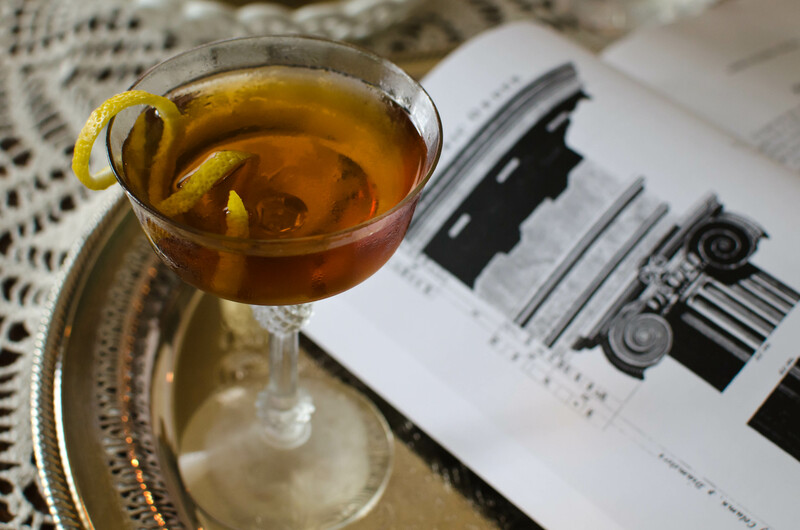 The Historic Core is a bit of a riff on the Manhattan, but also related to the Bijou. The Rittenhouse forms the base while the sweet and aromatic flavors are provided by the vermouth and the chartreuse. The apple brandy and bitters round out all of these flavors, the bitters accenting the spiciness of the chartreuse and rye while the brandy brings out the fruitiness of the vermouth and mellows out the sharpness from the herbal ingredients. I’m currently dumping my bottle of Carpano Antica into every drink that calls for it (either explicitly or just for sweet vermouth), and with this one I feel that any other vermouth wouldn’t quite fit the bill. You’ve got to stand up to a lot of firepower in the Classic Core: three ingredients are 100 proof (one of those being 101), and all of them have intense, unique flavors. If you’re subbing ingredients, say with Old Overholt, Applejack, and Martini Rosso vermouth, it may still work, but it wouldn’t have the punch that results from the original formula. If you tried something with the aforementioned booze, yellow Chartreuse, or a reduced amount of the green, would be necessary. In short, try this drink. If you can’t make it yourself, and you live next door to a really good cocktail bar, take them this recipe (Leon’s and Holeman & Finch in Atlanta could do it for ya’). Oh, and Carpano Antica is one of the best vermouths on the planet. Cheers. This entry was posted on September 8, 2011 by IJ Lauer in Angostura, Apple Brandy, Green Chartreuse, Rye, Sweet Vermouth and tagged angostura, balance, bitters, carpano antica, classic core cocktail, cocktail, left coast libations, recipe, rittenhouse, rye, sweet vermouth.